Haley's brand of foreign policy provided Republicans disoriented by this new Trump era with a link to their past. United Nations Ambassador Nikki Haley will resign her post at the end of the year, and the consequences for American foreign policy and the conservative movement may be monumental. As a moral ambassador for American values in the United Nations, Haley will leave a legacy matched only by President Gerald Ford's U.N. Ambassador Daniel Patrick Moynihan and President Ronald Reagan’s Ambassador Jeane Kirkpatrick. Among the qualities a truly great U.S. ambassador to the United Nations must exhibit is a healthy contempt for that institution, and Haley possessed it in spades. The former governor of South Carolina was a persistent advocate for foreign policy that privileged America’s allies and isolated its adversaries — a confrontational approach to diplomatic affairs that is too often alien to the sclerotic bureaucrats who populate Turtle Bay. Among the qualities a truly great U.S. ambassador to the United Nations must exhibit is a healthy contempt for that institution, and Haley possessed it in spades. Quite unlike most of her predecessors, Haley frequently demonstrated a willingness to sacrifice collegial comity in that body to highlight its most corrupt practices. She savaged her international counterparts for criticizing America’s commitment to peace and regional stability in the Middle East despite the lopsided financial commitment the United States has made to suspect U.N. organizations like the United Nations Relief and Works Agency for Palestine Refugees in the Near East, which has employed individuals affiliated with the terrorist group Hamas and operates facilities and schools that militants have used to store weapons. She withdrew the U.S. from the blighted United Nations Human Rights Council and the Orwellian United Nations Educational, Scientific and Cultural Organization, both of which have been undermined by the repressive regimes that populate them and which seem committed only to attacking Israel’s heritage and legitimacy. Trump surely has no love lost for the United Nations, but the way in which Haley conducted the affairs of state at the U.N. mission provided Republicans disoriented by this new Trump era with a link to their past. Indeed, Haley was not afraid to execute an American foreign policy that at times appeared to be at odds with the president’s stated policies. When Trump was making a morally vacuous congratulatory call to Turkish President Recep Tayyip Erdoğan following his victory in a vote that eroded Turkey’s democratic institutions and secured his rule, Haley was attacking Ankara’s human rights abuses. When the president was still clinging to the naïve notion that his force of personality alone could engineer some kind of thaw with Vladimir Putin’s Russia, Haley was denouncing the attacks on LGBT citizens in Chechnya, castigating Moscow for propping up Syria’s murderous President Bashar al-Assad, and declaring America’s policy toward Russia to be one of inherent mistrust. 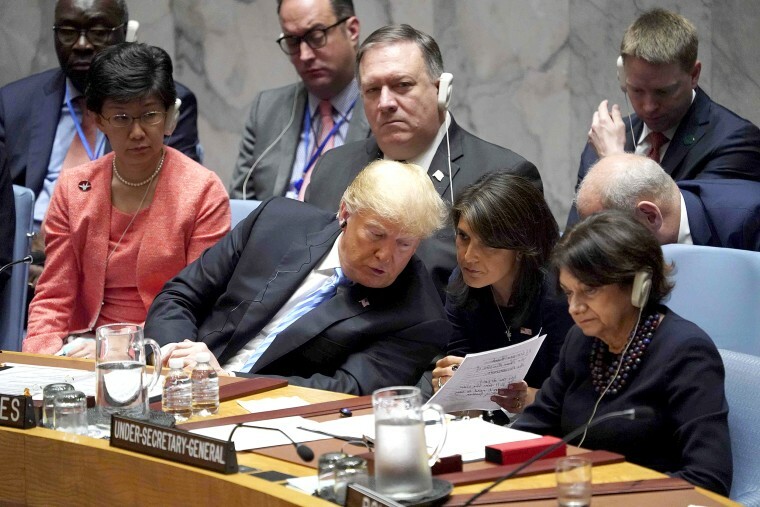 Whereas Trump ran for the White House on a platform of heedless isolationism — and had reportedly even considered the Assad apologist and Democratic Rep. Tulsi Gabbard of Hawaii to lead America’s U.N. mission — Haley’s ascension to the role reoriented American diplomatic policy in a more traditional direction, more typified by extroversion and unilateralism. And when Trump’s National Economic Council chief Larry Kudlow accused her of being “confused” about the administration’s forthcoming plan to impose even more punitive sanctions on Moscow, Haley pointedly fired back “I don’t get confused.” She was right, and Kudlow later apologized. Haley’s resignation from the American mission to the U.N. occurs at a unique time for the conservative movement. Republicans of all stripes — current and former, social conservatives and moderates, #MAGA and #NeverTrump — seemed united in opposition to the way in which Democrats conducted their efforts to scuttle Brett Kavanaugh’s Supreme Court nomination. Just as Kavanaugh’s confirmation hearings reminded Republican voters why they were Republican voters in the first place, Haley, too, has provided Republicans with a window into what the GOP was before Trump and what it still might be after he is gone. On both foreign affairs and matters of conscience, Haley was a tie that bound the principled conservative movement with an American president who campaigned in large part against that movement’s policy preferences. Her departure helps to sever that bond. The consequences could be profound.